A modern point of sale (POS) system is a combination of hardware and software that does much more than perform a transaction like a sale or return. From scanning products at the point of purchase to tracking inventory and labor costs, POS systems are a must-have for any brick-and-mortar business. However, what most business owners don’t realize is that point of sale hardware is just as important as the POS software. 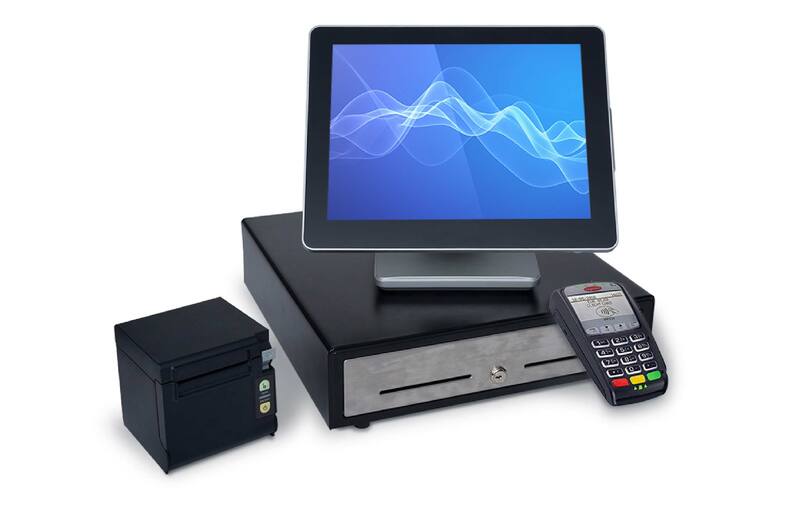 In this article, we’re going to take a look at what is POS hardware and why it matters. Simply put, POS hardware is all the input and output devices that make the point of sale software function at the point of purchase. For retail businesses and the restaurant industry in today’s modern landscape, point of sale hardware can range from a traditional computer setup to an iPad cash register and everything in between. The important thing to remember about POS hardware is that it’s designed to work with specific software. What does that mean, exactly? It means that you can’t buy just any receipt printer, plug it into your POS system, and expect it to work. When POS software companies develop software, they engineer it to work with specific hardware components and communication protocols. For this reason, software companies offer hardware bundles that are complete with all the necessary equipment you’ll need to get the most out of your software. Here are some of POS hardware components you’ll need for your business. Touchscreen monitors, iPads, and Android tablets are becoming more and more commonplace for brick and mortar stores. The low cost of these devices and user-friendly design make them ideal for small businesses on a tight budget. They also have little or no footprint on a retail counter unlike bulky monitors or cash registers that take up valuable counter space and inhibit employee-customer interaction. Besides a monitor or tablet, a credit card reader is another necessary component of a POS hardware bundle. As more consumers use credit and debit cards as their preferred payment method, you’ll want to make sure patrons have this option at your business. Additionally, make sure the card reader can accept EMV transactions, NFC or contactless payments, as well as traditional magstripe (swiped) transactions. Although more consumers prefer to pay with plastic, cash payments are still very much a part of small business transactions. A cash drawer is a staple from the early days of retail and isn’t disappearing any time soon. It holds the cash proceeds for a time period, usually a shift or a day and allows a customer to pay with cash and receive exact change in response. At the end of every transaction, it’s common practice to give the customer a record of the transaction. Typically that comes in the form of a paper receipt produced by a receipt printer. Receipts provide a printed record of the transaction so the customer can use it to expense items or meals or enable them to return an item that is not satisfactory. A barcode scanner streamlines the checkout process in any retail environment by reading the product’s barcode or UPC. A scanner uses a laser to bounce light off of the barcode to read it. Barcode scanners can be handheld to enable the employee to check out large or bulky items, or it can be a stationary scanner where the items to be purchased are passed over the laser to be checked out; the latter is more efficient in a high-volume environment. A POS system enables a faster checkout time which will appeal to customers. Transactions are transmitted by a secure system. Also, using a scanner will help ensure accurate transactions. By utilizing a POS system as goods are sold, the inventory is adjusting accordingly. Notifications can be set to let the business owner know when inventory for an item is getting low and needs to be re-ordered. The business owner can also be notified if inventory is not selling as anticipated which may result in markdowns. A POS system can keep track of inventory even if a business has more than one location. It eliminates the need to physically be at a location to check inventory. It also helps to reduce the amount of loss due to employee theft. One of the biggest benefits of a point of sale system is that employees and management can focus more on the customer service aspect of the business and less on counting receipts and inventory. With accounting software, the POS system can accurately track transactions into the proper accounting categories as well as produce monthly or quarterly reports for tax purposes. Financial reporting is essential to a business and can be used to create balance sheets, income statements, and cash flow statements. Coupled with sales data a business can adjust prices during a “slower” day of the week or schedule a recurring sale for the same period. The accounting data can then be analyzed to see how well the pricing strategy worked. Moreover, if a business already has accounting software, there is no need to purchase an add-on accounting module or to have to retrain employees on new, unfamiliar software. A POS system has reporting features that allow a business to keep a close eye on sales, profits, and expenses like Cost of Goods Sold (COGS). Point of Sale system reports give the business data in real-time. With cloud Point of Sale system reporting, owners can access reports even when they are at home or traveling. No matter where owners are, they’ll always have the information they need to make data-driven business decisions. Point of sale systems also enables management to gather customer purchase data to develop forecast models and create detailed reports. Sales reports can show trends so that the business can more accurately schedule its employees so that productivity is kept high. POS systems enable the employees to check in or check out for their shifts, and so ensure accurate payroll data. A good Point of Sale system gives a customer much more with detailed receipts than just a slip of paper with the date and the amount of the sale. The system can use inventory data to provide information such as item description, price, and savings from a sale or coupon. With the right system, a business can add coupons directly on the receipt, highlight a loyalty rewards program, acknowledge the return policy, and print a link to a survey about the customer’s experience. A POS system provides a unique way to promote continued interaction with customers. It can increase customer satisfaction by providing personalized service tailored to the customer. A POS system can provide sales history, and enable a business to set up preferred shopping lists, discounts, and customer rewards. A Point of Sale system can benefit a business in many ways. It can improve sales, keep inventory at manageable levels, increase employee productivity, and increase customer satisfaction. ID TECH is a global leader in secure payment solutions that designs and manufactures a full range of PCI-certified PIN entry devices, PIN on Glass readers, Magstripe readers, and chip card (EMV) readers, in addition to the acclaimed ViVOpay line of contactless payment products. For more information about ID TECH, please call 1-800-984-1010 or visit www.idtechproducts.com.